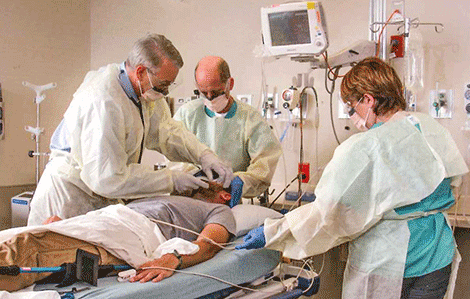 Trauma surgeon Mark Healey, left, during a trauma training session. POTSDAM-- St. Lawrence Health System’s Canton-Potsdam Hospital has received designation as a level three trauma center. New York State has four levels of trauma center designation. Level one is the highest, reserved for large university hospital systems in urban areas. Level three designation means that CPH meets certain criteria to provide life-sustaining care to critically ill or injured patients according to protocols established by New York State and the American College of Surgeons Committee on Trauma (ACS-COT). This includes performing life-sustaining surgery, and working with emergency services personnel and level I and II centers to coordinate care and transfers when necessary. Trauma care spans the scene of an accident or medical emergency, the ER, the operating room, the intensive care unit, and rehabilitation. A specially trained surgeon directs trauma teams at every stage of care. The American College of Surgeons’ Committee on Trauma verified their approval of the full designation earlier this month. The hospital received word from the state Health Department that the designation, sought for years, has been granted after a 2015 provisional designation. Department of Health designation was the final step for the hospital to achieve level III status. “St. Lawrence County is the most geographically isolated of any New York county in terms of access to tertiary care,” said St. Lawrence Health System President and CEO David B. Acker in 2015 when the provisional designation was made. “With the nearest Level I trauma centers nearly three hours away in Burlington and Syracuse, it was extremely important that we elevate the level of trauma care available closer to home."